Public Health Partners in Excellence Award! 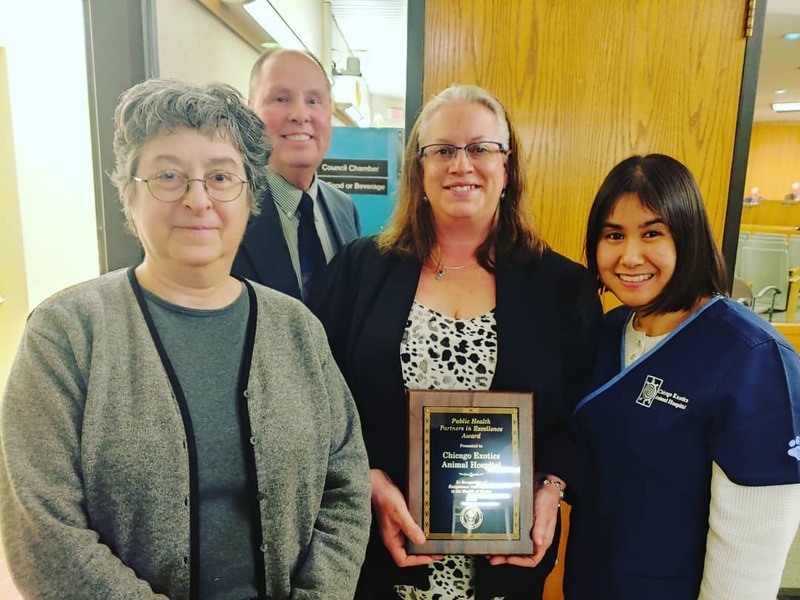 On Monday, April 1 2019, Skokie Department of Public Health gave us their coveted Public Health Partners in Excellence Award! This is quite an honor for us!! We do enjoy helping them with their displaced non-traditional animals and wildlife. See this wonderful article in the Chicago Tribune for more details. Dr Valdes has been busy contributing to articles! In the wild, guinea pigs hide signs of illness as long as possible as a survival mechanism. Guinea pigs are prey animals, and showing signs of weakness makes them an easy target for predators. According to Dr. Amy Guernsey-Youngblood, practice owner and exotic vet at University Veterinary Care Center in Topeka, KS, “They mask their illnesses for as long as they can. By the time they start exhibiting symptoms they are often very sick and have been fighting the illness for quite some time.” They’ve held on to that instinct to this day, making our job a little harder. Because they are so good at keeping symptoms a secret, the illness may be very serious by the time we catch on. Guinea pigs are tight-lipped when it comes to their health. You may have to be a bit of a detective to catch signs of illness before he’s willing to admit defeat. As you get to know your guinea pig – and guinea pigs in general – you’ll become familiar with his quirks and it will be easier to recognize when his behavior isn’t normal. One of the first hints a guinea pig isn’t feeling himself is a lack of appetite. Does his enthusiasm for dinnertime quickly subside? Is he suddenly leaving leftovers in his dish? Guinea pigs live to eat guinea pig food, so loss of interest in food is a major sign something isn’t right. Getting into the habit of weekly weigh-ins is useful to catch this early. Dr. Valdes recommends watching for signs like “hunching, sunken eyes, loss of energy, less active and alert, and refusing to interact.” She lists symptoms that might appear shortly as sneezing, drooling, discharge from the eyes or nose, dry/itchy skin or hair loss, lumps and bumps, or abnormal bathroom habits. If you just have a feeling something is off, a vet can run tests to help connect the pieces of the puzzle. Guinea pigs may need to be removed from their cagemates when being treated for and recovering from an illness. Your exotic vet will tell you whether you need to be worried about the illness being contagious. Dr. Guernsey-Youngblood recognizes that the decision of whether to separate a sick guinea pig from his cagemate depends on the individual. “If they are highly bonded, the separation may be stressful. On the other hand, a day of separation is sometimes useful to determine who is eating how much, and what kind of stools and urine they are passing. All of this is helpful information to share with your veterinarian.” As herd animals, there is also the possibility cagemates may start to bully and pick on a pig suddenly perceived as vulnerable. Congratulations to Dr. Horton on her current publication! Dr. Horton contributed a chapter in the recent Veterinary Clinics: Exotic Animal Practice issue. The chapter that she wrote is USDA Inspection for the Exotic Animal Veterinarian. Born: May 25th – our girlfriend here is a Gemini – but more excitingly she is a Rabbit according to the Chinese zodiac we were informed by Dr. Moy. 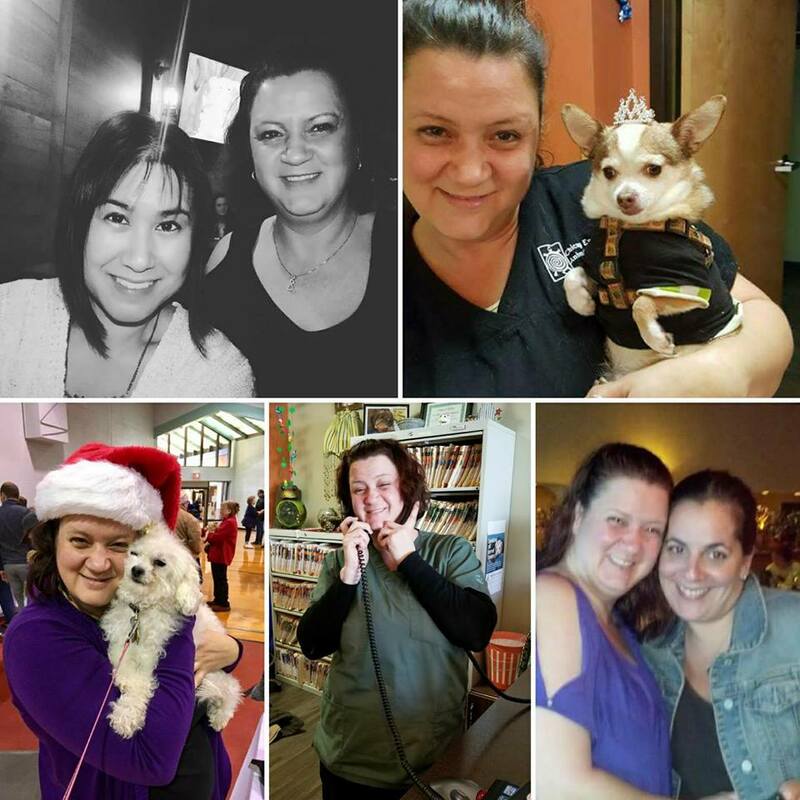 Joined the Team: Lamor went from client (she loves to talk about her girl, Inca the green iguana and how she used to bring her in for Dr. Horton) to receptionist in September of 2007! As the years passed she became an invaluable member of the team and Dr. Horton promoted her in 2015 to Office Manager and she never looked back! Currently, she is endeavoring to become a certified veterinary hospital manager through American Animal Hospital Association (AAHA). Before Chicago Exotics: Before she was our Office Manager, Lamor was a social worker and restaurant manager. With her bachelor degree in social work from Northeastern Illinois University and associate degree in substance abuse counseling from Oakton Community College, she utilizes the skills she learned from class and hands on experience to deliver quality management and client relations. The epicness of her past life doesn’t end there, she specialized in children with substance abuse issues because she wanted to help where she felt it mattered most! This background has imbued her with an unparalleled empathy which helps us proudly serve all members of our community. Favorite Part of Veterinary Medicine: Client education, interaction, and outreach are her favorites without a doubt. Current Obsession: Other than her obsession with timeliness – being late is not a good way to impress her no matter what she is doing in her life – she is obsessed with designer purses (ask her about Coach)! What You May Not Know: Lamor was born in Israel and immigrated here with her family when she was 5 years old. She speaks Hebrew fluently which if you are here when her mother calls you will hear! If you’re really lucky, you’ll hear her sing “Wind Beneath my Wings” to Erica in Hebrew. This month in, "Behind the Stethoscope" we are featuring our very own Dr. Stephanie Moy! Born: April 3rd – she is an Aries for anyone curious although we believe she may be under the wrong sign! Most importantly, our Dr. Moy is a Ravenclaw through and through! 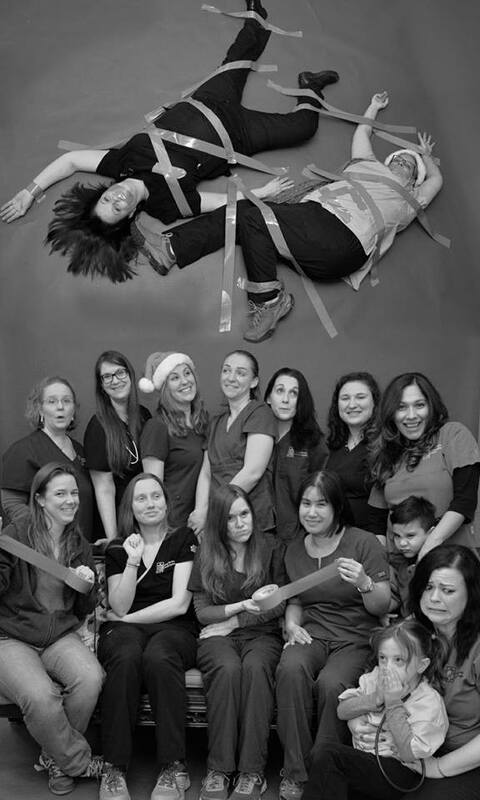 Joined the Team: Dr. Moy became our senior associate vet in 2011! Some may remember her from when she was on her veterinary externship in early 2000’s and while she was in veterinary school at the University of Illinois at Urbana-Champaign she played the part of technician while on her breaks! Favorite Part of Veterinary Medicine: Surgery! Just kidding, although she is a phenomenal surgeon, surgery is not where her heart is. She prefers her true love, education! Whether it is educating our clients, our staff, or her favorite, our veterinary student externs she is happiest when imparting wisdom to others. Current Obsession: Her exercise regimen (free weights specifically but not cross-fit), pub trivia, and teas! I was just informed that we did not mention her love of the Cubs … go Cubbies! Third Favorite: Guinea pigs – who can resist the chatty parsley eating cuties?! What You May Not Know: Our Ravenclaw friend is beyond brilliant but plays it cool. She graduated with a degree in Molecular Biology. She is also a bit of a wanderer having traveled to Hong Kong, Malaysia, England, France, and Germany to name a few places!